As Cities Raise Minimum Wages, Many States Are Rolling Them Back Legislatures and city halls are battling over who gets to set the minimum wage, and increasingly, the states are winning. Business groups argue that complying with disparate city laws is too complex. 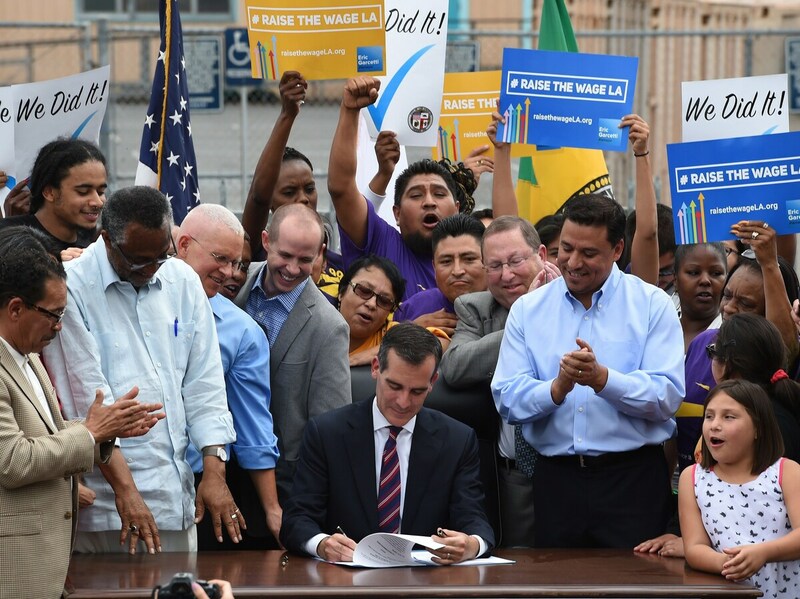 In 2015, Los Angeles Mayor Eric Garcetti (center) signs into law an ordinance raising the city's minimum wage to $15 an hour by 2020. Though California isn't one of them, 27 states have passed laws requiring cities to abide by state minimums. Janitorial worker Cynthia Sanders now has a longer commute into St. Louis, having moved further out because the cost of living was too high and she needed more space to raise her three grandchildren. When the Missouri state law takes effect, she says her wages will decrease and she'll have to cut back again. "I'm just scared for everybody, because it's a sad, sad situation, and I don't understand how it's legal," Sanders says. Minimum-wage increases had popular backing in cities, especially since the federal minimum hasn't been raised since 2009, says Brooks Rainwater, a senior executive at the National League of Cities. "People within cities, where the cost of living often times can be higher, needed a raise and city leaders have responded to that," he says, and now states are undermining those efforts. Business groups, meanwhile, argue that complying with disparate city laws is too complex, and that the additional costs would force them to curtail hiring which, in turn, hurts workers. In allowing the preemption law to take effect, Missouri Gov. Eric Greitens cited a University of Washington study on the negative effects of Seattle's minimum wage hike — a controversial study some experts dispute. Rainwater says whether on the issue of minimum wage, or paid sick leave, or other municipal measures regulating ride-hailing or home-sharing, states are now undermining city government. "There used to be a shared value around this concept of local control, you know, whether a conservative or a liberal, the idea that the representative closest to the people would be able to decide many of these fundamental questions," he says. Rainwater says attorneys representing cities have brought suit in court, challenging some of these preemption laws, but they face an uphill battle. "A big challenge here is, cities aren't enumerated within the constitutional powers, so they are, in effect, creations of the state," with little legal recourse, he says. Pat White, president of the central labor council for the AFL-CIO in St. Louis, says minimum-wage workers will lose income when the Missouri law takes effect Aug. 28, but so will workers higher up on the wage scale who were hoping to see corresponding increases as well. White calls state lawmakers' moves hypocritical, given how they chafe against similar efforts at the federal government to control states. "They're always complaining about how the federal government is dipping into what they want to do here in the state, but they're doing the exact same thing with the municipalities here, from the state level," he says. "Why have them even run for office, if they're not allowed to govern their own area," he says of city officials. Having a patchwork of different city or county laws can be a headache for employers to maneuver, especially when they have employees in many jurisdictions, says Mike Aitken, vice president of government affairs for the Society for Human Resource Management. Take a trucking company that has drivers based in, or driving around, many jurisdictions. "It becomes an administrative headache for sophisticated employers, let alone for a lot of your smaller employers that may be operating within one state," he says. Aitken says in passing preemption laws, states are operating well within their rights. "Cities are allowed to set their own minimum wage, but so are states then allowed to preempt them," he says. The issue has made a political crusader of Sanders, the janitorial worker. "We're mad enough to really, really fight now," she says, adding that she intends to call a long list of legislators and pay some of her state lawmakers a visit next week.